The eleven seasons of excavations at Trendles Field generated enormous local interest and thousands of people visited the site to see archaeology in action. Many expressed an interest in knowing what happened to the objects after the excavations finished and what stories they might tell. 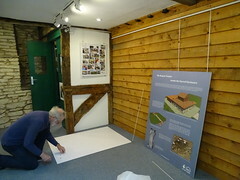 In parallel with the post-excavation activities at Manor Farm, Trendles Education Officer Megan and some of our volunteers, will maintain the links with local schools and the wider community established during the excavations, with outreach work involving exhibitions, talks, and hands-on workshops. Being able to work with schools throughout the year also provides a unique opportunity to enhance the requirements of the National Curriculum, and towards this we have prepared finds boxes with Roman and Iron Age objects from the excavations, and displays which can be loaned to schools for teaching sessions. Finds identification days where local people can bring finds from their gardens and allotments to be identified by finds specialists will be carried out throughout the year. Each summer there will be an Open Week with special events and tours of the excavation site at Trendles Field. The website, leaflets, and regular updates in local newsletters will keep the community updated as the story unfolds.